As some of you might know, I’m a bit of a photographer. Nothing big or anything along those lines but I enjoy taking headshots and some family photos when I can. One of the biggest hurdles photographers have run into is how to get their photos to their clients for proofing and final delivery. Today, I’m going to show you my process which uses three tools. Lightroom 5, WordPress and WordPress plugin known as Sunshine Photo Cart. This is by far the easiest process I’ve found to deliver images to clients. Let’s get started! First, you’re going to need to visit the Adobe Lightroom Developer Center and download the Lightroom 5 SDK. This is a ZIP file so you’ll need to extra the files to a folder on your computer. There are three folders in the plugin. API Reference, Manual and Sample Plugins. You want the Sample Plugins folder. In there is a folder ftp_upload.lrdevplugin. That’s your ticket to the big time! Now that you have your FTP plugin, you’ll want to go into Lightroom and install it. Simply open Lightroom and go to File > Plugin Manager. A window will open and you’ll want to click on Add in the bottom left corner and navigation to the location that you saved the folder on your computer. Select folder and away you go. So now we have the option to FTP, but first we’ll need to pick up the Sunshine Photo Cart plugin. This is a premium plugin that does cost. $99 for the standard version and $249 $149 for the Pro version. It offers some great features for communicating with clients, lightboxes for gallery views and extra payment options including Stripe which is my preferred payment processor. Just follow their installation instructions and you’ll be all squared up. The last thing we’ll need before we upload our first gallery is your WordPress Uploads Directory location. Now I use a host that uses cPanel so this location is public_html/wp-content/uploads. This might be different for your web site, so you might need to check with your host to find this location. Sunshine Photo Cart adds a folder sunshine to this uploads directory and you’ll need this full location to be able to upload photos in the right location. My full Sunshine Uploads Directory path is: public_html/wp-content/uploads/sunshine/. We’ll use this in our next step when setting up the connection to our web site in Lightroom. So let’s go back to Lightroom and get our first gallery online. Select the photos you want to upload and then click File > Export. At the top of the window you’ll see the Export To pulldown menu. Select FTP Upload from the list. If you don’t see it, something went wrong earlier. Try the install again. Here you can set all the usual upload settings including file size, compression and all that good stuff. One key I do recommend is to use sRGB as your Color Space. A lot of servers don’t do well converting other color spaces. I’ve had the best success with sRGB for these uploads. Since this first gallery is for review, I’ll keep the files smaller by selecting 80 for quality and resizing the long edge to 1800 and a resolution of 240. This will keep my files smaller and not take up as much web space. I’ll cover what to do to provide final download files later in the article. Finally, under the option of FTP Server there is a menu for Destination. If you haven’t selected one yet, click on the pulldown and select edit. You’ll be given the option to add your FTP server information, Username and Password here. You can store your password here, but realize it does not store it securely so it might be best to create a separate FTP user JUST for uploading images to keep your server secure in case someone hacks your computer and gets your password. Below that, you’ll enter that server path we discussed earlier and define the FTP Protocol. FTP or SFTP. Use SFTP if your host supports it, it’s a much more secure form of transfer. Once you’re done setting your server options, click OK and return to the Export window. Click Export and your export will begin. If you chose to not save your password, then a Enter Password window will popup and you’ll add your FTP password there. Now our images will upload to the server and we’ll head over to WordPress and setup our new gallery. Login to your WordPress web site and go to Sunshine > Galleries. At the top of the page click Add New and you’ll be taken to the page where you can add your new gallery. You will be taken to a page where you can enter your gallery Name and select your gallery options. There are two pull down menus offered to you. Images Folder and Download Folder. The images folder is the one used for your actual gallery. You’ll see our uploaded folder “example” and the three images I added there. You’ll also see the other folders that I have as galleries as well. 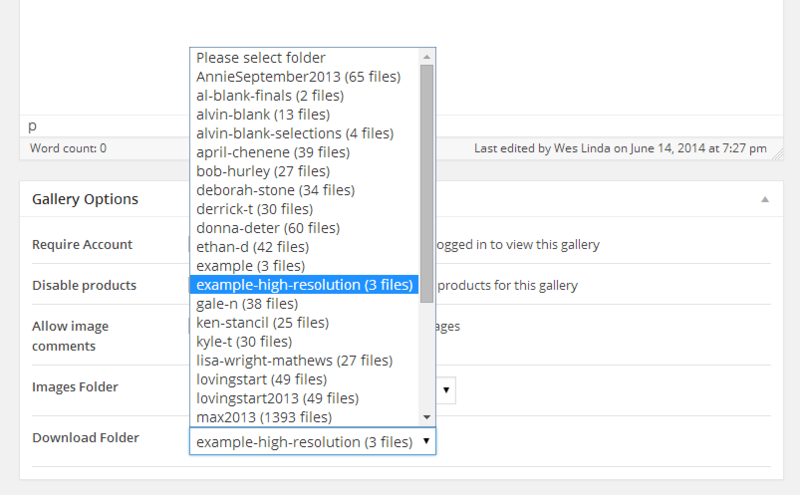 Select your images folder, select all your additional settings and click publish! That’s it, your gallery is online. Sometimes, you’ll want to deliver the final high resolution images to your client. This is a breeze with Sunshine. 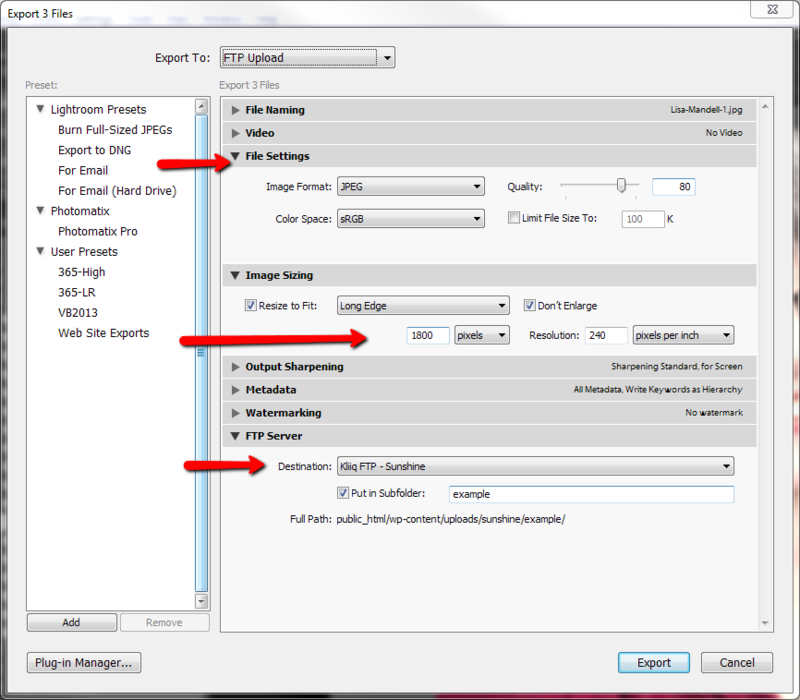 Simply return to Lightroom and change the file size information on your export. Change the folder name under in the Put in Subfolder option of the FTP server export settings and upload those images to your server. Return to your cart and pick the new folder under the Download Folder option. Once you’ve updated your post with the download folder, you’ll see the following menu option in the Gallery Options. Now that everything is setup, adding new galleries to your site is a breeze. Once you’ve edited and selected your images in Lightroom, simply begin your export. Rather than exporting to your computer, you’ll export directly to your web site. 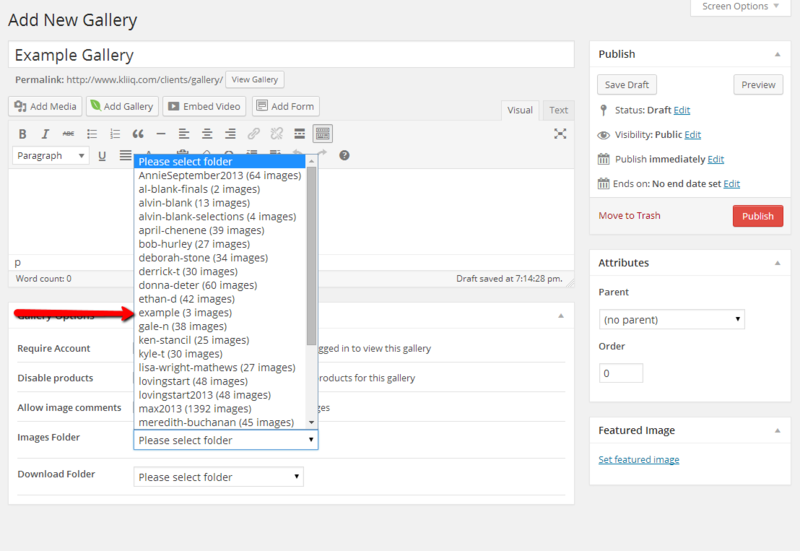 Then just login to WordPress and add a new gallery in Sunshine Photo Cart and click publish. Want to add a password that you can give to your client so only someone with the password can see the images? 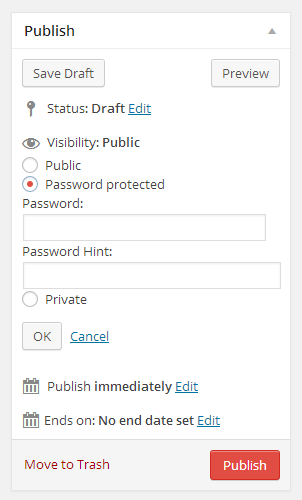 Just use the Password option under Visibility in the gallery Publish settings box. There you go. Now you’re setup to manage your photos on your own host with WordPress. One thing you’ll want to watch out for is server space. Uploading your high resolution images can take up quite a bit of space, so make sure you’re on a hosting plan that offers you the space you need. One of my key rules is to never skimp on your web host. Quality trumps pricing EVERY time. Finally, one of the most important things you can do is protect your web site with regular backups. Make sure your host does provide daily backups and keeps them for at least three days. This way if anything goes wrong, they can get your photos back. A great backup solution is VaultPress. Made by the team behind WordPress. Great pricing and great at protecting your data. This is nice. I’m waiting to see 2.0 before springing for the cart, but would you know if this would work with the FTP Publish Service plugin instead? It would be nice to have changes made in LR be reflected in the Sunshine galleries. In other words, is there a way in the sunshine admin to easily update the gallery if the folder that it pulled from gets changed? And if it does, is it smart enough to just update the changed files instead of the whole folder? I haven’t seen something at that level. Just having the ability to upload quickly means a ton to me. The idea of live monitoring would likely need to be built on the Lightroom side of things. Curious thought. Thanks for showing us how to do this with Sunshinephotocart (which I bought yesterday). It did take me a looooong time to find Sunshinephotocart though. Before that, I tried Zenfolio, Shootproof, Smugmug, Photoshelter, Instaproofs, PixProof, Proofbuddy, Sell Media, Photocrati and a whole lot more! Tried WooCommerce too, but they got acquired by Automattic and it remains to be seen which direction they will take photography wise. But yes, I think you’re right. Sunshinephotocart looks great and with the release of 2.0 it’ll only get better! I am taking a look for different options for client proofing and I have found this. The only missing thing is how to pass the selection made on the website to Lightroom. (imagine that selected images are to made a wedding album). Hi, i realy like to work like this but the link to lightroom 5 sdk is not working anymore. Is there a new plugin anywhere? Thank u very much for sharing this! Hi Dorothea, they’ve moved away from using FTP to put files up in Sunshine. You can now upload large images directly into Sunshine Photo Cart in the admin. If you’re looking for a gallery plugin that will offer direct connection with Lightroom, my recommendation would be Envira Gallery. It’s a really solid option here. NextGen also has a solution here.